Ensure that your workplace is secure with these Photo ID Name Card Badges. Available with multiple backing or attachment options, this name badge can be customized with your logo and up to 2 lines of text. 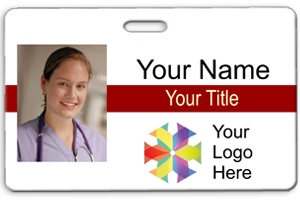 Produced on PVC plastic and printed in full color high-quality digital output, this horizontal Photo ID Card Name Badge is ideal for a secure workplace environment. This simple, crisp design features your name and title with your logo on the right, as well as your photo on the left side. Choose from four stripe colors and select from a wide variety of attachment styles. Order your Photo ID Card Name Badge today!